A Windham couple will follow in the footsteps of a Civil War regiment next month, seeing for themselves the sites described in the letters. WINDHAM – David and Carol Manchester have recently gotten close with a relative of theirs — a young man, about 20 years old, with a dry sense of humor and a deep love of his country. His name is Joseph Manchester, and he’s been dead for 150 years. Through his letters, found last year in the attic of a family farmhouse, the Windham couple feel as though they’ve gotten to know Joseph as well as if they’d met him. And they admit, it’s become a bit of an obsession. Next month, they’ll travel down the East Coast, following the footsteps of his Civil War regiment, seeing for themselves the sites he describes in the letters, written between 1861 and 1863, to his family back home in Windham. “They have boasted and bragged enough. If they want to fight they had better try us here and see how they will get out of it,” Manchester wrote to his father on Dec. 12, 1861, while at Hilton Head, S.C.
As they travel south, the couple also plan to take with them a book — written by Carol Manchester and in the process of being printed — that contains transcriptions of the 35 letters they found, along with context from her research about the war and life in Windham at the time. They hope to get it in bookstores along the trail, or at least in Beaufort, S.C., where Joseph Manchester was buried after dying from a gunshot wound. He was struck in the right shoulder during an assault on Fort Wagner and died a couple of weeks later from gangrene. The battle, an attempt to cut off Charleston Harbor from the Confederate army, was depicted in the 1989 film “Glory,” starring Matthew Broderick and Denzel Washington — a fact that excited the Manchesters, who had seen the movie more than once. That’s one of the reasons they were inspired to make the book. Another was to pass on a family story for generations of Manchesters to come. It’s hard to be a Manchester in Windham without being a history buff. Their ancestor Stephen Manchester was the fourth settler of the town in 1738, back when it was known as New Marblehead. He became a local hero when he shot and killed Abenaki Chief Polin, bringing an end to years of strife between the Indian tribe and the white settlers along the Presumpscot River. David Manchester can list the names in the lineage between Stephen and himself, but he knew little about the great-granduncle who died in the Civil War, until they found the letters. 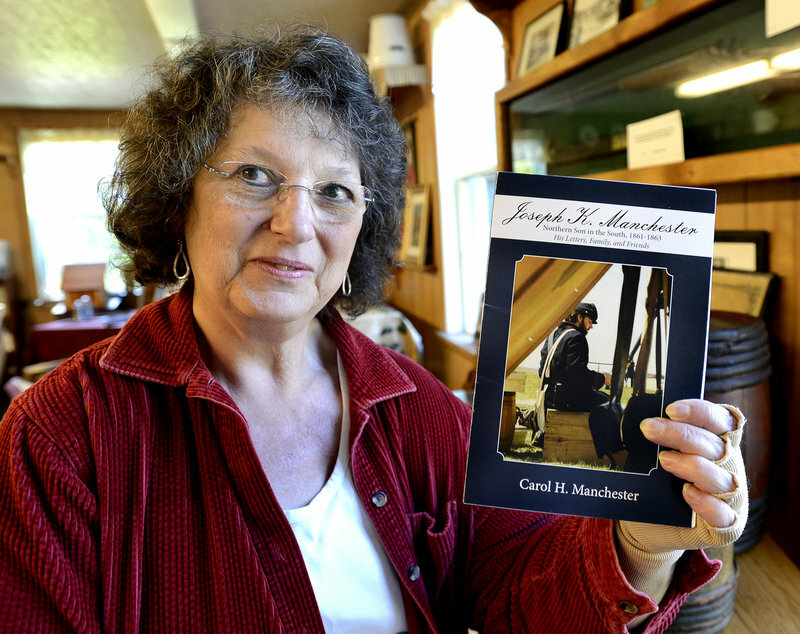 Carol Manchester will talk about Joseph’s life and letters in a presentation at the Windham Historical Society at 7 p.m. Monday. It took her about a month to transcribe them, she said, working on one for a couple of hours every night with a magnifying glass. His handwriting was legible, beautiful even, she said, but the ink on some of the letters had faded, and his sentences would run on with no punctuation. “That was typical of the day,” she said. In one letter, he wrote a series of punctuation marks and told his mother to insert them in the rest of the letter wherever necessary. “He was a smart person. He had humor,” David Manchester said. Many of Joseph’s characteristics come out in the letters. The Manchesters find him curious and observant. He sought to get to know every city in which he stopped, learning about the people and the food. He talks about the types of nuts he ate, and he sent home flowers from different states. He was entrepreneurial, too. One time, he bought a bushel of apples and sold them off individually to try to make more money to send home to his family. He was constantly concerned about the family farm, how the crops were doing and how much hay came in. He repeatedly reminded his younger brother, Seward, David Manchester’s great-grandfather, to study hard in school. He told his mother not to worry about him; he was well-fed and warm. Still, he was realistic about the risk to his life, and it was one he was glad to take. His father, who was ill, hadn’t wanted him to go to war and leave the family without a strong male figure, but Joseph insisted he fulfill his duty to his country. His patriotism was evident in many letters, including the one written on Dec. 21, 1861.